This is me and Robby...my first real boyfriend (in my eyes anyway). We went to his Jr./Sr. 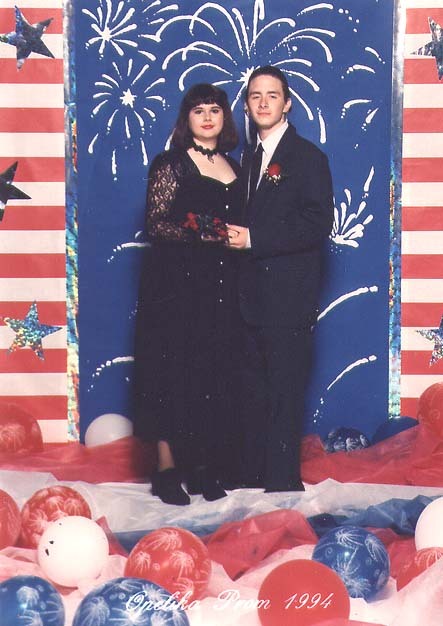 Prom (during our Jr. year) in 1994. I know I had a good time and think he did too. I thought he looked so handsome in his tuxedo, of course I always thought he was handsome...but still. And I thought I looked pretty good too, in my dark green lace dress and my hair done up in spiral curls (course you can't see my hair for the dark background I was in front of!). I remember there wasn't much dancing going on...the whole girls on one side and boys on the other sort of thing. We were in his school's lead out too. Although they mispronounced my last name (not that that was uncommon!) I really enjoyed it. We walked down a big white stairway that curled around to the side a bit from the front of the country club it was held at. His mother was there to see it and she video taped it. I only saw that tape once...God knows if it still exists. But I remember her saying to Robby as she filmed him getting into his car "Oh Robby, have a good time." She sounded all choked up and excited for him. After the Prom, we went and changed clothes and went to our friend Jasmine's house for a little party. I remember I was in my usual black biker shorts and black button-up tank top. We had loads of fun! And since I have a whole page dedicated to Robby, I'll leave it there. 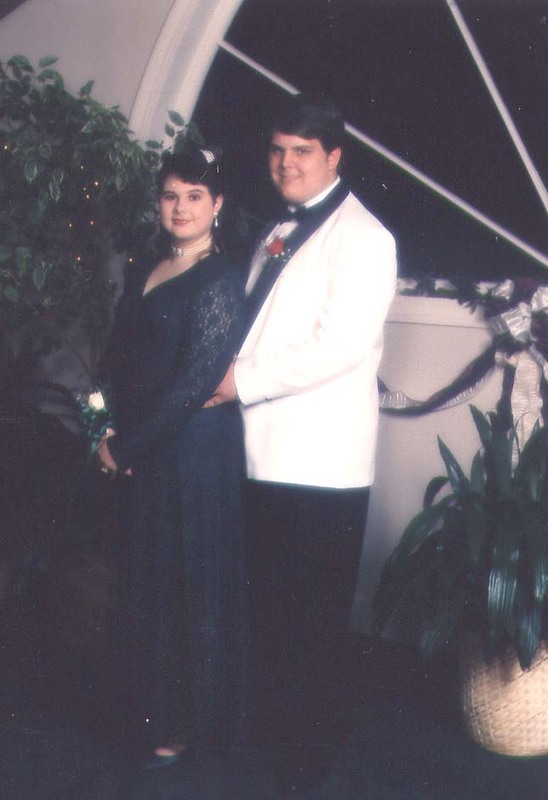 My second Prom of 1994 was at my school Opelika High. I went with my boyfriend at the time...Matt. He was a nice guy...a little odd but nice. We were both a little dark and so we went to the Prom dressed like Mortisha & Gomez Addams. Well, as closely as we could! Matt even had a cigar he kept in his jacket pocket. We danced and socialised with our friends and had a good time. I remember how we got together even. It is so cool, in a wierd way. From what Matt always told me...he saw me in Main Street (the big corridor at our school where lunch was held) and was like wow! (remember, this is his account!) So he knew some of the people I sat with at lunch and asked them stuff about me and found out that there were a few things that we had in common, like Mystery Science Theatre (a sci-fi/comedy tv show). So he started a club for that show for afterschool once a week to watch an episode, hang out, and have snacks. He went around with a notebook asking people if they were interested, etc. and to put down their phone numbers and addresses so he could contact them, etc. So when he got to me I put my information down. Apparently then, once he knew where I lived he would drive past my house (from what he told me anyway) and stuff like that. He was really excited when I actually showed up to these after school meetings and we would talk and all. Then there was the MASH rehersals. He found out that I was auditioning and so he figured he would too...hoping we would both be in it. Turns out, we did! I was Radar and he was Cnl. Blake. (Bear in mind, during all of this I was dating Robby) So we went to rehersals and all and talked, etc. When the time came for Robby to dump me Matt stepped in being all comforting like, etc. (I was a total wreck!) He started sending me flowers, etc. and once hid a dozen roses on the set for me to find after our performance. So, needless to say we started going out. Didn't last all that long though, I would always go back to Robby from time to time and decided to end it with Matt. This is my friend Bryan! He is my good Christian friend! He's cool too! We *never* dated!! So stop thinking like that! I can't remember how we met...probably in a class together or something. But anyway, we went to our Senior Prom together. 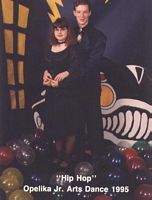 Neither of us was seeing anyone and we wanted to go to the damned thing, so...if you don't have a proper date, what better way to go to a dance than with a friend. You know you'll have a good time and won't have to worry about all the after stuff! NOT a good photo of me though with my big glasses and short slicked back hair (my Dad made me get a perm that year and I hated it and had it chopped off!). But we had a great time. He was in the school choir (GREAT voice!) and a couple of other clubs and so we were in the school's lead out, which was cool. Our play that year was Little Shop of Horrors (one of my fave cult films) and bryan was Seymore! So as I was Stage Manager & Make-Up person we got to work together on that which just ruled! We still chat via email and are still good friends! This is me and Jonathan at the Jr. Arts "HipHop" dance. We went to the same church together and were friends. He was a year or two under me in school. He was in the school choir...yes I was a choir groupie! I had several friends in the choir. Jon did the voice of Audry the Plant in our Little Shop of Horrors production. He had a good singing voice and it was really deep so it was perfect for Audry. This is me and Jason. We dated most of our Senior year of school. We had met way back in like the 7th grade! So we were really good friends long before we dated. He came from a good Christian family and his younger brother was totally awesome! He lived in Hueytown while I was in Opelika, so we only saw each other 3 days out of the month usually. I would drive up on a Friday and pick him up from school (I would leave school early) and we'd go hang out, etc. His folks owned (and still own) a flower shop so he would send me flowers, etc. and I would go in the back and help prepare flowers (dethorn roses, etc.). 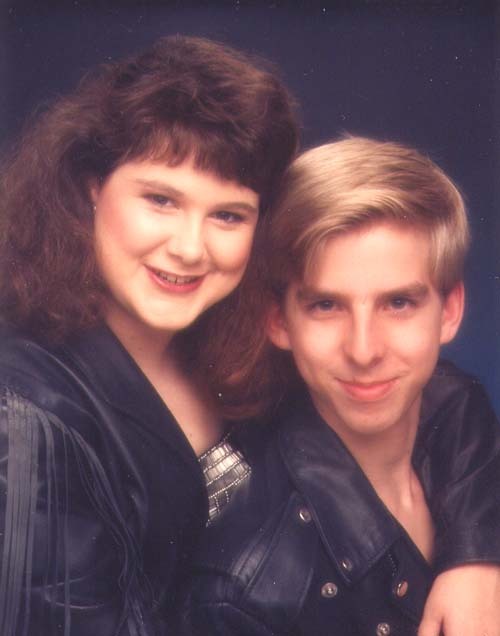 One day we went to the mall and had some Glamour Shots taken of us together, this is one of my faves...plus I can't find the rest! I would spend the night at his house when I was in town and me, Jason and Aaron (his younger brother) would stay up watching movies and clowning around. I remember one night...Jason had gone on to bed and me and Aaron were watching some home movies we all had made and we were laughing so hard and for such a long time that in the morning it hurt to hell and back to breathe. I went to the hospital and it turned out that I had bruised my ribs and cartilage from laughing!! Now *THAT* is having a good time!! When I think about it, we never really broke up (as like one of us saying so, etc.) we just stopped talking and lost contact. He was a really good, genuine guy.